The Avro Canada CF-103 was a proposed Canadian interceptor, designed by Avro Canada in the early 1950s as a development, and possible replacement of the company's CF-100 Canuck, that was entering service at the time with the Royal Canadian Air Force (RCAF). Although intended to be capable of flying at transonic speeds, the CF-103 only proffered a moderate increase in performance and capability over the CF-100; subsequently, the aircraft never progressed beyond the mock-up stage. Even before the prototype of the CF-100 had flown, Avro Canada was conducting studies of potential advanced variations of the aircraft, as the RCAF was seeking an interceptor with greater high-speed performance. Due to the perceived limitations of the CF-100's original "thick", straight wing, Chief Designer John Frost proposed a series of refinements that included a thinner swept wing. In December 1950, the Avro Aircraft Design Office decided to proceed with a redesign, primarily incorporating the early series CF-100 fuselage structure with a new swept wing and tail surfaces as part of the C-100S design study. Frost considered the new design as an interim aircraft between the CF-100 and the more advanced C-104 project. The salient changes to the basic wing planform were in decreasing its chord and thickness, and adding a 42� sweep to the leading edge, creating a near-delta wing configuration; the tail surfaces were also swept back. One version that was considered featured two streamlined fuel tanks blended into the leading edge of the wings near the three/quarter position. Despite the use of more powerful engines, the redesign had very modest performance specifications, with a planned maximum diving speed of Mach 0.95, scarcely better than the placarded Mach 0.85 speed limit of the production CF-100 Mk 2 and Mk 3. Avro executives, recognizing that the company had already suffered due to the protracted development of the CF-100, determined that Frost's revised design would provide a "hedge" against the CF-100's failure to secure long-term contracts. 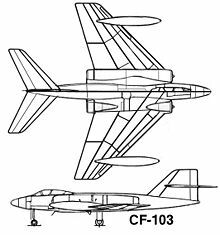 In 1951, the Canadian Department of Trade and Commerce issued an order for two prototypes and a static test airframe, under the CF-103 project designation. Jigs, tools and detailed engineering drawings were in place by June 1951, with wind tunnel testing, conducted at Cornell University, completed by November 1951. 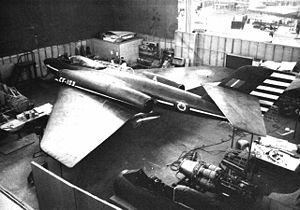 Although a wooden mock-up of the CF-103 was built, along with a separate cockpit area and engine section that was partially framed in, the mock-up did not feature an undercarriage unit nor any interior fittings. Two different tail designs were fitted with the initial effort only having a swept leading edge of the tail, while the definitive version had a much more raked appearance. The engineering and installation requirements for the CF-103's proposed Orenda 17 jet engines were not finalized, as the experimental "hybrid" using an Orenda 8 compressor unit and Orenda 11 two-stage turbine, matched to a "reheat" unit, had not been fully developed. During 1951, flight tests carried out by Chief Development Test Pilot S/L Janusz Żurakowski and other members of the Flight Test unit, revealed the development potential of the CF-100 had outstripped the intended performance envelope of the CF-103, while Frost and the Design Office became preoccupied with more sophisticated designs as potential replacements for the CF-100. Work on the CF-103 stalled, with the maiden flight originally scheduled for the summer of 1952, postponed to mid-1953. With Cold War pressures mounting, the Canadian government demanded that production of the latest CF-100 fighter, as well as developing more advanced variants of the Canuck should predominate, leading the Avro company to curtail the moribund CF-103 project in December 1951. Although the mock-up languished in the experimental bay at the factory, a dramatic event served to preclude any attempt to restart the project. On 18 December 1952, from a height of 33,000 ft (10,000 m), Żurakowski dived the CF-100 Mk 4 prototype (RCAF Serial No. 18112) to Mach 1.06. His "unauthorized" test flight resulted in the final scrapping of the mock-up. Campagna, Palmiro. Requiem for a Giant: A.V. Roe Canada and the Avro Arrow. Toronto: Dundurn Press, 2003. ISBN 1-5500-2438-8. Milberry, Larry. Sixty Years: The RCAF and CF Air Command 1924-1984. Toronto: CANAV Books, 1984. ISBN 0-9690-7034-9. Page, Ron, Richard Organ, Don Watson and Les Wilkinson ("The Arrowheads"). Avro Arrow: The Story of the Avro Arrow from its Evolution to its Extinction. Erin, Ontario: Boston Mills Press, 1979, reprinted Stoddart, 2004. ISBN 1-55046-047-1. Avro Canada CF-103 Pictures and Avro Canada CF-103 for Sale.